Produto para recupera iPod formatado ou bateu música de salvamento de pasta de arquivos e vídeo que são apagados por engano de memória de iPod. 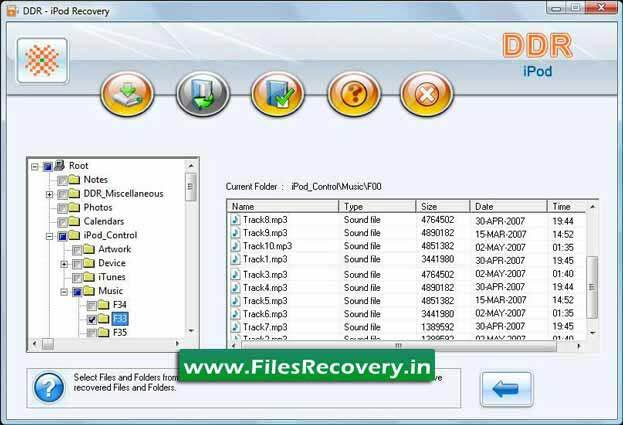 Product to recovers iPod formatted or crashed file folder rescue music and video which is deleted by mistake from iPod memory. Application is also retrieve accidentally deleted pictures or lost images. iPod restoration is the unique backup utility. Software is capable to extracts the data from the memory when iPod is in frozen or reset state. Utility works with all versions iTunes (like 7.0) which is used to addition or deletion of files in iPod. Tool runs on following windows operating system win 2003 advance server, Vista, XP hoe, professional or media center, NT with all major versions like 3.0, 4.0, 2000 professional, server, millennium and window 98. 32 MB RAM, 9 MB free hard disk space with Pentium or equivalent processor is the minimum requirement for using this application. Product supports all major file systems of windows operating system like NTFS, NTFS5, FAT16, FAT32 and VFAT. Tool restores corrupted music, lost video and any type of data deleted by any operating systems either window or Macintosh. Features: * Tool supports all major audio video format including mp3, mp4, m4a, m4b, jpeg, mpgev etc. * No need of any technical skill is required to operate it. * Very easy and safest in use due to extremely powerful GUI (Graphical User Interface) * Rescue data accidentally formatted from iPod memory. *Application supports apple series iPods like iPod Mini, iPod first to fifth generation, iPod shuffle, iPod Nano and iPod Hi-Fi.